I was selected as a Parsons representative along with 3 other students to collaborate with the Columbia Business School MBA 2013 students in a class called Luxury Design Strategy. Different groups were assigned with luxury clienteles, our group had the opportunity to work with the luxury house, Hermès. As an iconic brand, rich in heritage, Hermès seeks to find a way to integrate technology into their customer experience while preserving the core values of the brand. In collaboration with Marisa Glick, Margrethe Harboe, Michael York, Nattavadee Temkasem, Sarah Robinson, Silvana Perez Cunarro and Wei Ng. As a group we were featured in in Forbes as well as Women's Wear Daily. On our survey, we asked our respondents to give us 3 words to describe the Hermès Brand and website. Here are the words that described the Hermès brand: luxurious, classic, craftsmanship. Whereby the website were described differently: whimsical, fun, colorful. 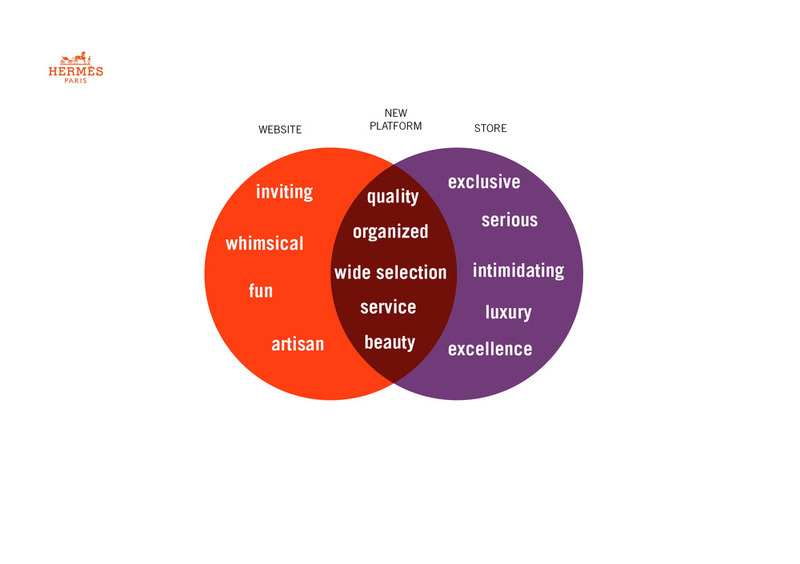 There is a disconnect in perception of Hermès between the website and store. Therefore, we made it our objective to converge the best of the 2 experiences and merge the Hermès perception into one. How can Hermès engage the customer before they even enter the store? Once inside the store, how can Hermès tell the story behind their famous “métiers” in a welcoming and interactive way? The brand explores “brand-relevant strategic content” brought to life in a way in keeping with their heritage, at the same time underscoring the fact that in the world of luxury Hermès is in a class by itself. Introducing, The Living House, a multidimensional program integrating technology into the Hermès customer experience. The Living House combines the tactile experience luxury with the rich story telling and history of the Hermès brand. The CBS and Parsons team designed the whole user experience.